By 1838, “Hard Times” had descended upon the nation. Thousands of people quite literally didn’t know where their next meal was coming from. The deep economic depression brought on by over-speculation and a collapse in real estate prices almost halved the price of cotton and forced every New England textile mill to close, with one exception: Nathaniel Stevens’ mill in North Andover, Massachusetts. It not only remained open but expanded its production, taking up the slack for all the others. Workers there got above-average wages of $4.50 per week plus $2 for board, for a 76-hour workweek. Ten cents was a significant sum of money, nearly two hours’ pay at the Stevens mill. Thus, the American public took very careful note of the new 10-cent piece just showing up in its pocket change at the time: the Seated Liberty dime. Actually, the coin had made its first appearance in 1837, the year before. But in 1838, the United States Mint made a fundamental change in its design, adding 13 stars along the obverse border encircling the central portrait of Liberty. Those stars would remain in place until 1860, and the “Stars Obverse” dimes would come to be regarded as a major, distinct component of the Seated Liberty series. Very few coins of any denomination were jingling in most Americans’ pocket change in 1838; the depression had led to hoarding of federal coinage, and so-called Hard Times tokens were being widely used as a money substitute. 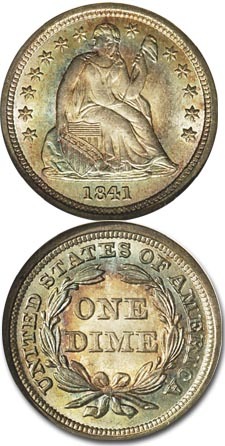 When coins did appear, however, the likelihood was high that they would include Seated Liberty pieces, for during the late 1830s, the new design was introduced not only on the dime but also on all four other silver coins then being issued: the half dime, quarter dollar, half dollar and dollar. The Seated Liberty portrait resulted from the teamwork of two highly talented men: portraitist Thomas Sully, who designed it, and Mint engraver Christian Gobrecht, who executed dies from the artwork. It depicts a seated figure of Liberty with her right hand resting upon a shield and her left hand grasping a pole topped by a Liberty capsymbols of preparedness and freedom. On the quarter and half dollar, the Mint retained essentially the same reverse as the one that had appeared on their immediate predecessors from the Capped Bust series: a naturalistic eagle with a shield superimposed upon its breast. On the half dime and dime, however, the eagle gave way to a simple statement of value. On the dime, the inscription ONE DIME appeared within a wreath, and that in turn was encircled by UNITED STATES OF AMERICA. In 1838, some dimes came with small stars, others with large stars. Slightly more than 406,000 dimes were struck that year at the newly opened New Orleans branch mint without the stars on the obverse; otherwise, all dimes of that date were struck in Philadelphia and have the stars. From 1841 onward, Seated Liberty dimes displayed a fold of drapery at the crook of Liberty’s elbowthe result of modifications by miniaturist Robert Ball Hughes. This was intended in part to give the portrait greater “respectability” (a theme that would emerge again 75 years later, when Liberty’s bare breast on the Standing Liberty quarter led to hasty revisions to head off scandal). Prior to that, most examples bore no trace of this. “Partial drapery,” an illusion caused by die-clashing, was visible on some 1838 issues, but the new full drapery design didn’t appear until 1840. For that year, it was coined in relatively small numbers. Besides adding the drapery late in 1840, the Mint also adjusted Liberty’s shield to an upright position. The California Gold Rush of the mid-19th century had an almost immediate impact on U.S. coinage: By adding so much gold to existing supplies, it depressed the market value of that metal in relationship to silver, and that in turn led to widespread hoarding and melting of silver coins. These were soon worth more as metal than as money. To restore proper balance between the two metals and thereby halt the hoarding, the Mint reduced the weight of its silver coins. The change took place in 1853 and was signified on the dime by the placement of two arrows alongside the date. By 1856, the public had become acclimated to the silver coins’ new weight, so the Mint removed the arrows. The 1856 dimes came in two varieties, with large and small dates, but both are quite common. The 1853-55 dimes with arrows also are relatively common, but the 1853 dime without arrows has a mintage of only 95,000 and is one of the scarcer Stars Obverse dimes. Other scarce issues include 1846, 1856-S, 1858-S and 1859-S. Branch-mint examples were struck at both New Orleans and San Francisco, and their “O” or “S” mintmarks can be found on the reverse, above the bow of the wreath. Although the entire Stars Obverse dime production from 1838 to 1853 and again from 1856 through 1860 totaled over 51 million pieces, mintages varied widely, from a low of 31,300 in 1846 to over 5.7 million in 1856. Proofs were made for public sale in 1858 and 1859 but also are known for earlier dates. Included is an 1841 dime that lacks drapery (even though its business-strike counterparts had it) because excessive die-polishing removed it almost completely. Stars Obverse Seated Liberty dimes exist in substantial numbers in grade levels up to Mint State-64. The supply thins out considerably in MS-65 and drops sharply in levels of MS-66 and above. Points to check for wear include Liberty’s breast and knee and the tips of the leaves on the wreath. A complete set consists of nearly three dozen pieces, and while that is not excessively long, this group is collected most often by type, rather than by date and mint. It is, after all, just one part of the complete Seated Liberty dime series, and the series as a whole spanned more than half a century.